From the swamps of Louisiana comes a fictional character that is entirely composed of vegetation, has the appearance of a monster, and the consciousness of a human. He is called the Swamp Thing. 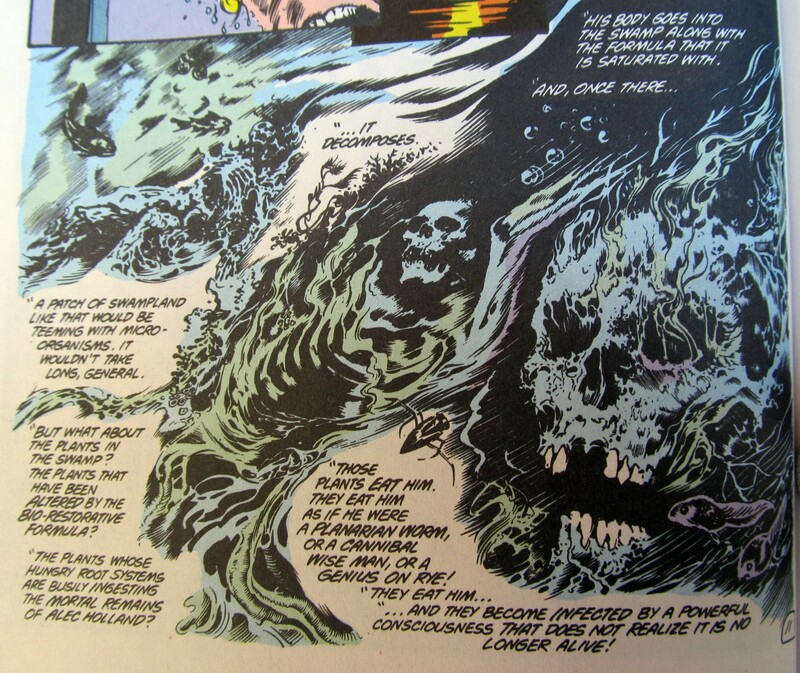 Created by Len Wien and Bernie Wrightson, the Swamp Thing made his first appearance in the ninety-second issue of House of Secrets in 1971. He was then given his own series, which after 19 issues was handed off to up and coming author, Alan Moore. Moore was an established comic book writer in the United Kingdom, but this was his first time writing for an American imprint. 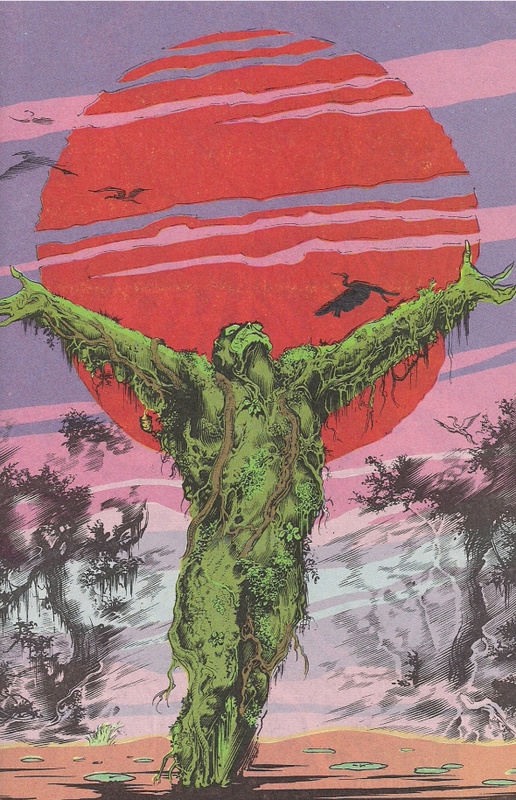 The work Moore did on Swamp Thing left a lasting impact on the comic book industry and helped establish Moore as one of the greatest comic book writers of all time. While Moore wrote more than fifty issues of The Saga of the Swamp Thing, I am narrowing this post down to the first volume, which compiles issues 20 – 27. 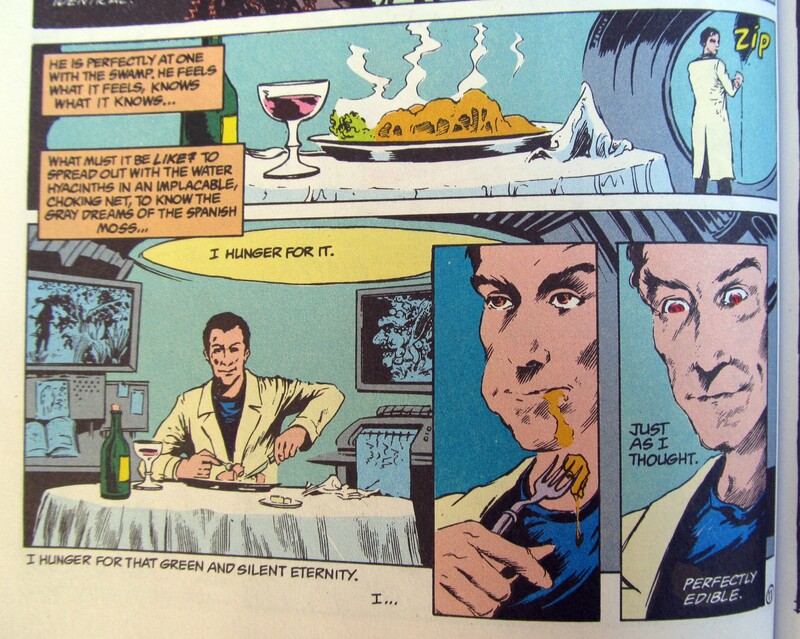 When Moore inherited the character, the Swamp Thing was thought to be (and also thought himself to be) the vegetable form of Alec Holland, a scientist who blew himself up while experimenting with a bio-restorative formula he was developing. Because Moore had some plot lines to dispense of before he began his own telling of the story, it only made sense to have the Swamp Thing killed off in the first issue so that he could reveal who or what he really was. The beginning of issue #21 finds Dr. Jason Woodrue examining the Swamp Thing’s corpse. Woodrue is a villian that goes by the name Floronic Man and is himself a plant-human hybrid. The men who killed the Swamp Thing got Woodrue out of jail so that he could help them do an autopsy. During the autopsy, Woodrue makes a startling discovery: “We thought that the Swamp Thing was Alec Holland, somehow transformed into a plant. It wasn’t. It was a plant that thought it was Alec Holland! A plant that was trying its level best to be Alec Holland.” In the explosion, Holland’s body was completely incinerated, but due to the help of the bio-restorative formula that followed Holland into the swamp, the swamp plants fashioned themselves into a new creature with the form of a man and the consciousness of Holland. The bio-restorative formula is key because it allows the Swamp Thing to regenerate. Woodrue knows this and takes advantage of it. He moves the Swamp Thing’s resting body back to the swamp. Conveniently he finds Abby Cable there, one of the Swamp Thing’s good friends. Woodrue informs her that the Swamp Thing is not Alec Holland, news that is difficult for her to take. As the Swamp Thing awakens, he must also come to terms with the fact that he is not who he thought he was. Meanwhile, Woodrue/Floronic Man harvests and eats a tuberous growth protruding from the Swamp Thing, which enhances his powers to control plant life. The Justice League is called in, but there isn’t much they can do. This is a job for the Swamp Thing who, while wandering through the swamp coming to grips with his new identity, senses trouble in The Green. He then realizes that Floronic Man must be involved, at which point he arrives on the scene and gives Floronic Man a good beating and a stern talking to. Floronic Man is obsessed with the idea of plants taking over and destroying all other life. He has clearly gone mad, threatening to make the plants “pour out oxygen” so that “all the animals will die.” He is convinced that only plants will remain and that “it’s the only way to save the planet from those creatures.” The Swamp Thing rhetorically asks, “And what will change the oxygen back into the gasses that we need to survive when the men and animals are dead?” That seems to shut Floronic Man up. Schooled by logic, he slowly loses control of the plant life he had recruited to do his dirty work, at which point the Justice League swoops in and picks him up. The Swamp Thing retreats back to the swamp, embracing his new identity – elated to be alive and feeling at home in the swamp. The final three “chapters” of the book are focused more on Abby. The Swamp Thing is around, and he definitely shows up for some fight scenes, but Moore seems to be working on developing Abby’s character. After all, she and the Swamp Thing have a future together. In one fight scene, a demon rips the Swamp Thing’s arm off. 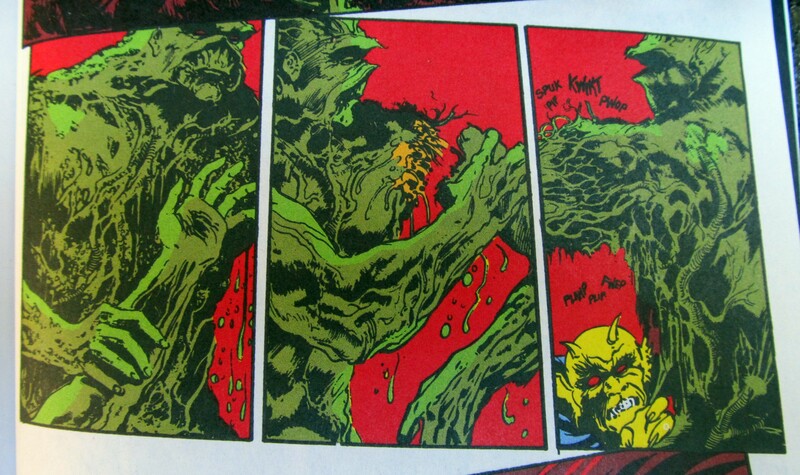 At which point, the Swamp Thing nonchalantly picks up his arm, reattaches it, and resumes fighting the demon. Throughout the book, Moore’s writing and storytelling is exceptional. A brief recap such as this cannot do the book justice. Moore’s prose must be read to be truly appreciated. The Swamp Thing is a fairly minor character in the comic book world, and one of the very few that brings botany to the forefront. Thanks to Moore and the artists that worked with him, Saga of the Swamp Thing gives this great character the exposure and legacy it deserves. This entry was posted in Botany, Reviews and Recommendations and tagged Alan Moore, Alec Holland, Botany, botany in popular culture, comics, Floronic Man, heroes and villians, Jason Woodrue, Justice League, plants, popular culture, superheroes, swamp thing, swamps, The Green. Bookmark the permalink. 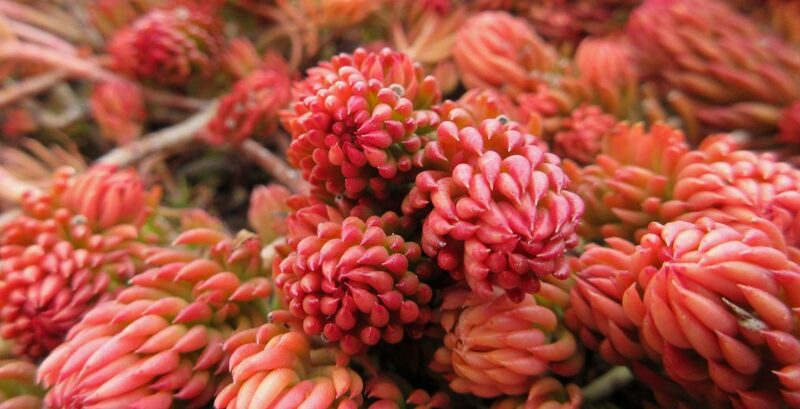 Great post – always good to see examples of botany crossing in to the mainstream! The super villain Poison Ivy in the Batman comics is another example. She is obsessed with all things plants and uses plant pheremones and toxins to conduct criminal activities. Hi. Great post. I remember reading this graphic novel some years ago-one of the few wonderful integrations of plants and stories where the plants aren’t a nebulous malevolent force e.g ‘The dark forest’ but a thoughtful character. I’m in the process of writing my own children’s novel featuring plants. Would love some feedback if anyone is open to finding out more. Cheers, Julie-Anne. Thanks! Happy to hear that you enjoyed the review, and cool to hear that you are working on plant-related fiction. I would love to learn more. Feel free to get in touch. Thanks. I’m in the editing stage now so I’ll forward a copy when it’s a bit more polished.